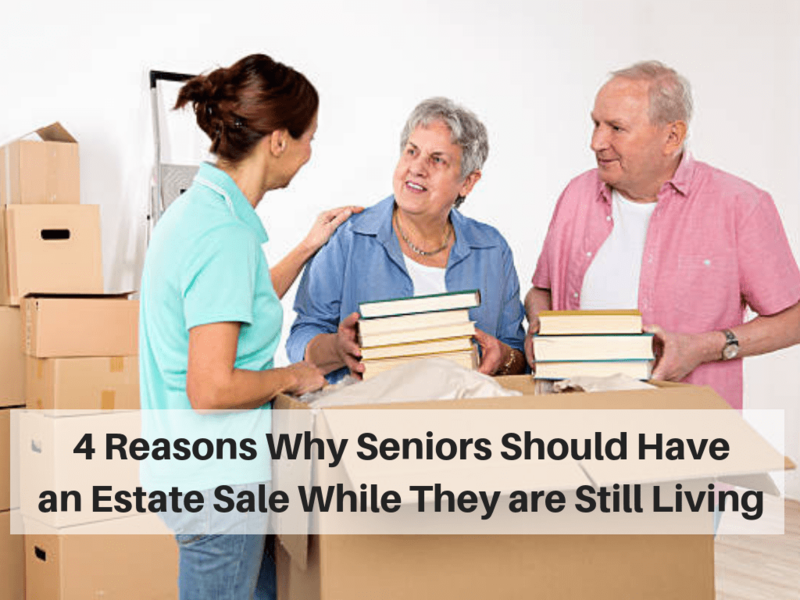 4 Reasons Why Seniors Should Have an Estate Sale While They are Still Living. 4 Reasons why Seniors should declutter and have an estate sale while they are still living. At Orlando Estate Ladies, LLC, we understand that disposing of the property of loved ones when they downsize and move, or when they die, can be very difficult, both logistically and emotionally. But, as Marlies Bredel explains, expert help is available. We get the opportunity to work with the families of loved ones past to help them sort through the memories of a lifetime and convert memories and belongings into cash to settle the estate. It’s never easy and we understand that. This is why our service is so vital and why our company is different. We work closely with families, Real Estate Agents, Probate Attorneys and others, to make estate settlement a seamless and smooth event. It is best for some of the planning to be done in advance. Most estate sale companies, like Orlando Estate Ladies, LLC evaluate, sort, organize, clean, price and tag items. If needed they may be able to help call in a specicif appraiser for valuables. They publicize and advertise the sale, often posting photos online of items included. I wanted to take this opportunity to share some sad, but true news about our parent’s lifetime collection of stuff. Younger adult generations won’t take their aging parents’ stuff, The New York Times reports. Some of these parents are paying thousands of dollars for professional help downsizing. The resistance among grown children could be financial — or ideological. No one wants the family china. At least not the generations set to inherit it. Tom Verde writes in The New York Times that millennials and Gen Xers are uniquely resistant to the influx of furniture, kitchenware and general stuff that comes with their parents’ downsizing. They can’t even donate it. Access what you want easily. By sorting through the family treasure chest of collected stuff over the years, elderly parents and children have the opportunity to join in this effor together as a family project. Together the family can decide which items, if any, should be donated and let the family express their feelings about which items each of them would like to have. Once the family has decided what items to set aside for keeps and who gets it, and after you have hired a professional, it’s best to step away from the liquidation process. Reorganize sentimental possessions for safe reach. Enjoy memories stored in mementos, photos, letters, videos and other treasures you’ve been saving. Have a designate space in your home to store these items so that you can access them easily when you children or company comes over. You may want to have times of going through memoirs and take a trip down memory lane with loved ones and friends. No need to package in boxes taped up if you want to visit them. Organization is the key. This tip is very important if seniors are downsizing and moving into a smaller home or apartment. Make room to easily through the home in case you become disabled. By reducing the amount of things you have stored through the years you will open up and free space to rearrange furnishings and make room for mobility items, scooters, power recliners, tray table or other items you may need as you age. You will also have room for walkers, walking with a cane, wheel chairs and other mobility assist items. Make things easier for your heirs when you pass away. As mentioned above there are studies that show that most adult children and heirs of the family estate do not share the same love and hold dear the family heirlooms as the parents did. Most heirs do not want all of the items parents have stored over the years. You want to leave heirs a lighter load by making a will and a trust and keeping them updated. Decluttering now protects your loved ones from inheriting the burden of a home full of stuff. By taking care of this prior to the passing of loved ones, it helps eliminate the family feud and lifelong bitterness between heirs over who got the best items in the inheritance. Having an estate sale while you are still living gives your adult children or heirs to participate in the event and help you decide which items they may want and which items you should part with. This will make it easier when it comes time to divide personal affects. This also gives the family an opportunity to work together in deciding who gets what in the will instead of opting for a family feud after you are gone. If you are an heir of aging parents and would like to have a free concultation with us in advance we will gladly meet with you and share our expertise about how to help your elderly parent part with things and prepare for an estate sale. Contact the Orlando Estate Sale Ladies today.